Senators have clashed fiercely at the confirmation hearing for Donald Trump’s Supreme Court nominee Neil Gorsuch. The seat was vacated by the death of Justice Antonin Scalia 13 months ago. There were angry exchanges among Democrats and Republicans over why Barack Obama’s choice for the post had not been given a hearing last year. Mr Gorsuch is yet to be questioned, but in a short address strongly backed an independent judiciary and said that judges cannot by lawmakers. He largely took a back seat on the first day of the Senate Judiciary Committee hearing. He faces a tough grilling on Tuesday and Wednesday. Before he spoke, Democrats lined up to berate Republicans for blocking Mr Obama’s nomination of federal appeals court judge Merrick Garland as Justice Scalia’s replacement. Ranking Democrat Dianne Feinstein said she was “deeply disappointed that it is under these circumstances that we begin this hearing”. Fellow Democrat Senator Sheldon Whitehouse said he feared Mr Gorsuch’s appointment could lead to another “Republican 5-4 special interest spree”. If Mr Gorsuch, 49, is approved by the Senate he would restore a 5-4 conservative majority on America’s highest court. But Senate Republicans pointed to a quote by then Judiciary Committee chairman, the Democrat Joe Biden, in 1992 saying then President George HW Bush should not name a nominee to any Supreme Court post until after the upcoming election. Senator Lindsey Graham said if the Democrats had been in the same position last year they would have acted the same way. “I don’t think any injustice has been done,” he said. Republican Ted Cruz said “Justice Scalia’s legacy would have been in grave danger” if Mr Obama’s choice had been allowed. “We would have seen the democratic process controlled by five unelected lawyers in Washington DC,” he said. In delaying the choice until after the election, “the American people played a very direct role in choosing this nominee”, he said. As far as Mr Gorsuch’s qualification for the post was concerned, senators did not dispute his achievements. 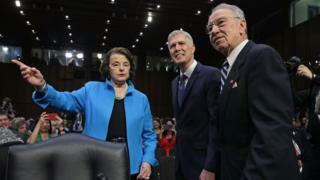 Committee chairman, Republican Chuck Grassley, hailed Mr Gorsuch’s “exceptional record”, saying he had shown unfailing commitment to “the preservation of our constitutional order and the separation of powers”. Mr Graham, although pointing out his well-known opposition to Donald Trump’s election campaign, said the president should be praised for picking the “best choice available”. It is unclear whether Democrats will try to block Mr Gorsuch’s confirmation. If they do, their options are limited. Republicans control the Senate and they can change the chamber’s rules to make it easier to confirm Mr Gorsuch if any attempt is made to block him. They hope to have Judge Gorsuch, currently a judge on the Denver-based 10th US Circuit Court of Appeals, confirmed before Congress leaves for recess on 7 April.